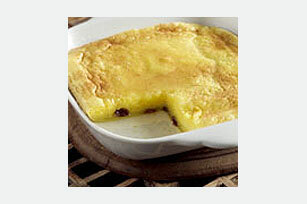 Eggs get the royal treatment when baked together with cinnamon and raisins and topped with a sweet sherry reduction. Preheat oven to 275°F. Beat egg yolks in medium bowl with wire whisk until thick and lemon colored. Add baking powder, cinnamon and raisins; mix well. Pour into greased 8-inch square baking dish; cover with foil. Bake 45 minutes or until toothpick inserted in center comes out clean. Cool 10 minutes. Bring sugar and water to boil in small heavy saucepan 10 minutes or until mixture forms a light syrup, stirring constantly. Remove from heat. Stir in sherry; pour over egg mixture. Sprinkle with additional cinnamon, if desired. Cut into 64 (1-inch) squares. Serve warm or chilled. The method of separating yolks from whites by pouring eggs back and forth between broken shell halves can introduce bacteria into the eggs. Instead, pour cracked egg into clean funnel or wash your hands and then pour cracked egg into palm of hand, with your fingers parted enough to cradle the yolk, let the whites slip through. This dish originated with the Dominican nuns of the Santa Rosa convent. Egg whites were used to paint the walls of the convent, and it is believed that this recipe was conceived to use the remaining yolks. Makes 16 servings, 4 squares each.